Is there a better way to learn history than reading textbooks or browsing the internet? The best way, in my opinion, is to visit places of historical interest and get a feel of what has been. If that is not possible, a visit to a museum is the next best alternative. The Imperial War Museum North in Manchester is no exception. Reading about the World Wars and contemporary wars is one thing. 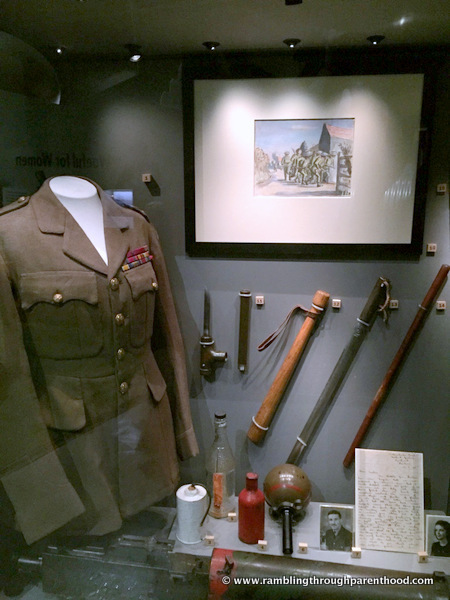 Looking at war memorabilia, real artefacts from real people who experienced it all, is something else altogether. The IWM North is full of large and small exhibits that are a stark reminder of the death and destruction wrought by the unending conflicts of the last hundred years. 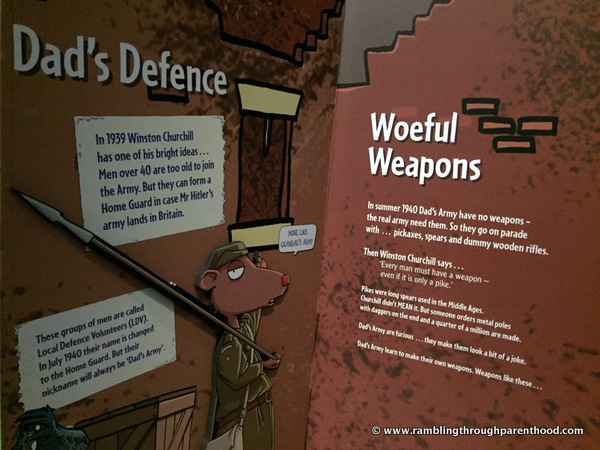 We have been to the IWM North a few times now, and had a different experience each time. I am not just talking about the displays that have changed. As J has grown older, his attitude towards the Museum and the exhibits has changed as well. 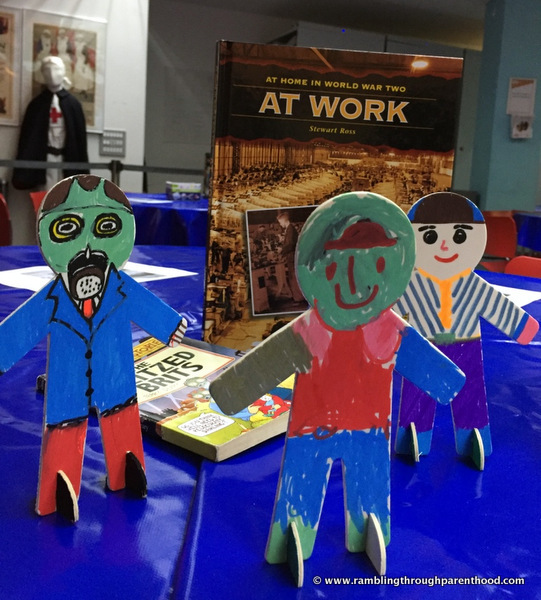 The main theme of the exhibition for this half-term is the Dad’s Army. Nothing to do with the sitcom and the film by the same name, but more about what life was like in the Home Guards during the Second World War. J was happy to sit through an interactive story session, which told the story of Dotty and her mother and their adventures during the War. 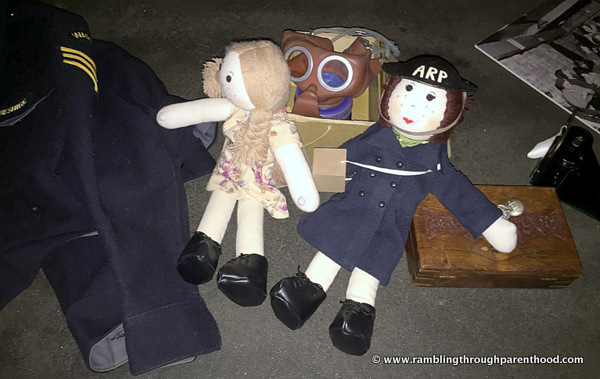 We had the opportunity to handle a real children’s gas mask, items of uniform and shrapnel from a bomb that hit Manchester all those years ago. We then had a go at creating our own Home Guard personnel in the Family Studio. While M got very creative drawing a gas mask, J and I just got busy using all the colours in the box. We ended up with a mish-mash of characters. We then headed off to explore the other main exhibition area. 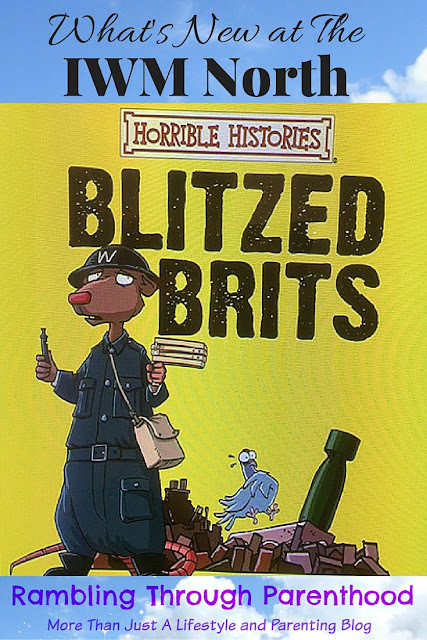 Horrible Histories®: Blitzed Brits is a very hands-on and dynamic exhibition that puts a family-friendly spin on what was a very trying time in our country’s history. Where else would you get to milk a cow, even in simulation? J was fascinated with the air-raid shelter and insisted on harbouring his family under it to keep us safe. Fun apart, it was upsetting to read about the Evacuees. I hate to imagine how horrible it must have been for parents to let go of their children and never see them again. That said, war has always been, always will be, distressing. And history, fascinating. So if you happen to be in the North West of England and are looking to entertain and educate the kids, do head over to the IWM North and check out the real Dad’s Armyand Blitzed Brits. Entry to the museum is free and donations are kindly received. Disclaimer: We were guests of the IWM North as part of their blogger preview event. All opinions are my own. I haven't been to the imperial war museum since I was in school! I need to take my son there when he gets a little older! It is sad to hear about how the evacuees suffered it was a terrible time. I went to the Imperial last year and it was so frightening to think about how these children must have felt. The IWM (in London too) always seem to have great activities for kids, and I can imagine it's somewhere I might go with my daughter more when she's older. I completely agree that it's often the little, personal items which really make exhibitions more real too. I didn't realise there was an Imperial War Museum in Manchester as well. I can see us going when a topic comes up at school. It looks like an incredible place. Somewhere I would definitely like to visit at some point. Thanks for the info! Oh my, this looks amazing - if only we were closer!